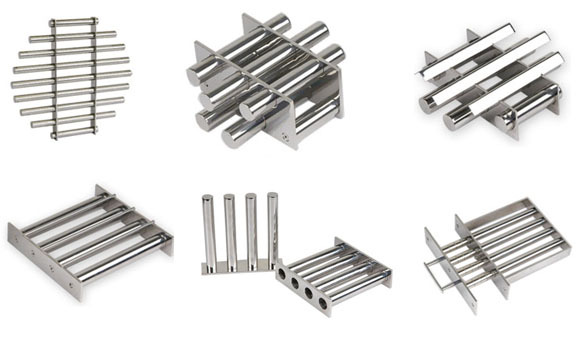 ChouMag Grate/Grid Magnets are designed for product purity for free flowing materials such as carbon black, drugs, chemicals, cosmetics, food products, plastics, grains, spices, sugar, honey, salt, and minerals. These units are easily installed in any hopper or floor opening, chute or duct. The Magnetic Grids protect your processing machinery against dangerous tramp iron. Magnetic filter bars fixed onto a stainless steel frameworks, when anything containing iron substances passes through the framework, Iron particles are attracted to the bar magnets by magnetic fields. As a result, your equipment and facilities will be safe and sound, and your products will be safe for consumption. OEM orders & Customer Designed Applications are also welcomed. 1. Diameter of magnetic filter bar is 1"
3. We have Square type and Round type grate magnets. Two layers, three layers or more can be provided on request. 4. The distance between to magnetic bar is 1 inch, 1/2 inch also can be provided on request. 5. Constructed of SS304 & SS316 casing tube and casing frame, it is equipped with high density Ceramic 8 magnets and high-energy Rare-earth magnets to suit your application. 6. 90 degree angle baffles and Dia5mm round SS bar can be attached to the grates on request. 7. Easy-clean type can be provided on request. 8. All the magnetic bars are waterproof.